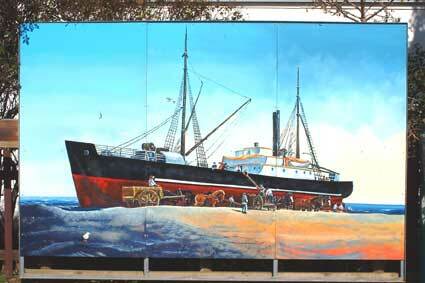 This mural depicts the "Kennedy" aground on the Manawatu River bar in November 1928. The Coley Bros. Contractors are unloading the ship at low tide using horses and drays to move the cargo. Once unloaded, vessels usually floated free on the next high tide. The "Kennedy" was built in Sydney, Australia in 1865. She weighed 220 tons, was 138 feet long, had a beam of 19 feet and draught of 9 feet. She was built as a three masted schooner-rig steamer but in 1905 was converted from a single to a two-hatch vessel and the passenger accommodation removed. She sailed between Lyttelton, Wellington and Foxton and carried coal, cattle and general cargo for 64 years. The "Kennedy" was one of the many coastal steamers to use the port of Foxton. Site: North side of Foxton Service Centre, Main Street.